Shelley making me breakfast early in the morning. But anyways, I slept awesome. I always sleep well in a bed vs tent. I woke up a little early and tried to schedule just a few blogs before I headed out. As usual, it is so time consuming. Shelley was up early making me breakfast. When I was ready, she brought me out a plate of bacon, three over easy eggs, English muffin, jam, avocado and the lemon bar from last night's dinner. Wow! I had such a feast! Everything was so amazing. I felt SO taken care of and I don't deserve any of it. I was so full and couldn't finish all of the food. I wish we had another hungry hiker to feed. Shelley also packed me out a brownie, lemon cake and some strips of bacon to take with me. Why is she so amazing?! Me, John, wags and Shelley. I got my stuff ready to leave and John drove Shelley, wags and myself to the trailhead. It was so sad to leave. My time with them was very short. They were so good me and treated me like family. I just couldn't believe it. I thanked them a million times again, gave hugs and was on my solo way. I'm going solo this section since I parted ways w my group. As I walked away, I was still overwhelmed with gratitude on what had just happened. God's timing is always so perfect and he uses amazing people to serve me in ways I cannot fathom. What better way to spend my halfway mark than getting refreshed in Chester to get me going to Oregon? It is so close now! And I am so pumped. I felt like a new person coming out of town and ready to take on this last half of the trip. Packing out bacon is the best. Though I was in a little food coma, I was excited to hike again. It was very hot but no surprise. I met an older hiker named David. We go the same pace. And we also passed first for awhile. It was nice to talk to them. I didn't really see anyone else today. Maybe everyone is at drakesbad ranch, but I want to bypass it. I made it 21.6 miles today. Not bad for starting at 830a. I'm curious to see my mileage since I'm not hiking with anyone. Your motivation is always so different when you're by yourself. 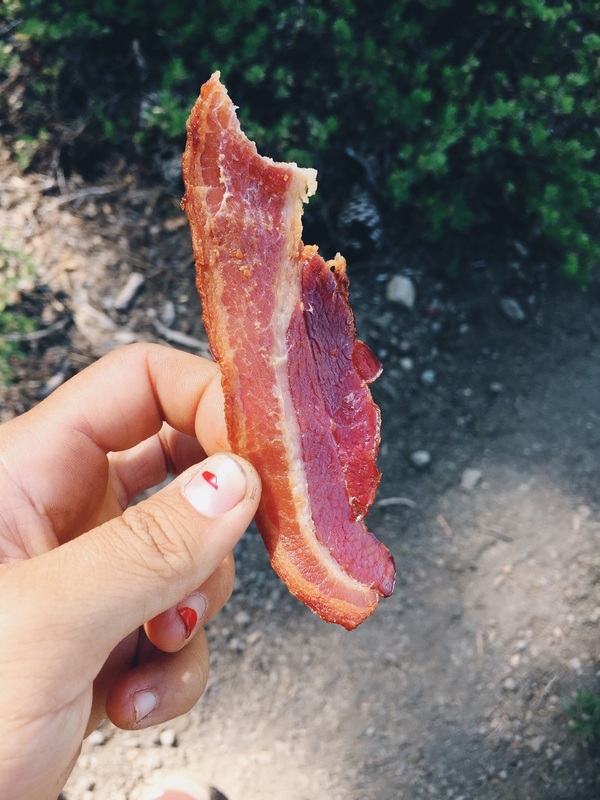 I nibbled on some strips of bacon for snack and it was the best thing ever. Packing out bacon is brilliant. I camped out by the crossing and there's lots of bugs. There was this giant black one that was stuck on my mesh and would not come off by just shaking it. I'm so sleepy now. I hope I can sleep throughout the night. Sick bugs destroying my life.